I am getting slack, aren't I? On the upside, I finally got instagram and twitter on my second phone so I have been posting things a little more frequently there. My instagram name thingy is missdirections...though originally it was missdirectiond so thanks to a typo so you may see me pop up there as well. 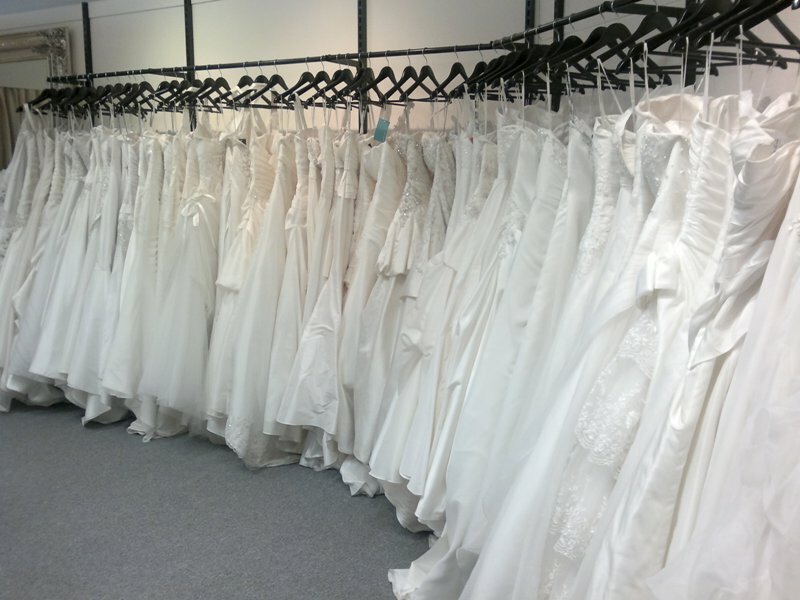 MissA and I hit up all the big wedding dress stores in Canebrra over two days...it was a lot of wedding dresses! The aim of the day(s) was to give her a better idea of what suits her shape so she could look more broadly online. Of all the general styles, ballgown definitely won out. This one was one of our favourites. We found THE dress. You all know how it goes, the dress that looked stunning and suited her perfectly, with enough detail to cover the 'princess' elements but not so much it's tacky. The dress that had just the right amount of train and the perfect corset back...have I mentioned the detail? It was amazing. This one. 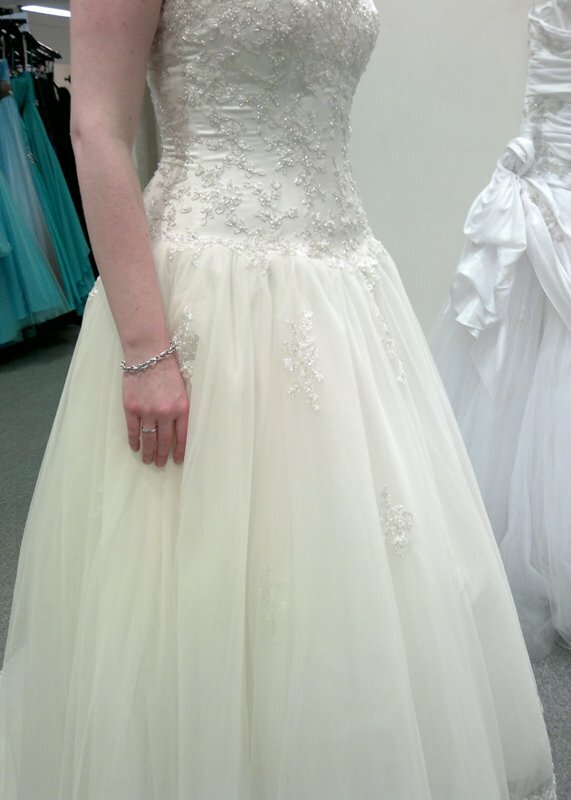 It's a Maggie Sottero called 'Lizette Royal'. The one MissA tried on was stapless, so missing the flower shoulder strap. The flowers on it are amazing! Did I mention she bought it? She was a little skeptical of the dress on the hanger, thinking the flower on the waist was 'too much'. It looked amazing. Took it off and tried on another 4-5 dresses in that store, none of them really compared. Put THE dress back on again. I even tried on a chiffon gown in a similar colour and style to the expected bridesmaid's dresses for comparison sake. Running late for the next dress shop so we get out of these dresses and start to say our goodbyes. We have enquired about the cost of all the dresses but have been told that info will be put together for us at the end of the sesssion...well turns out we only want the info on THE dress. The assistant gives us the figure...$3600. About $1000 over MissA's intended dress budget, but hey, it's THE dress. She has 15 months until the wedding, she can save a little more by then. And then they drop the bombshell...if she buys THE dress, as in the one she treid on, they will do her a deal for $1300...that's 65% off. We still have to leave the shop to get to move onto other things...like a football game that afternoon...but long story short, MissA went back with her mother on the Tuesday to try on the dress, compare it to her 'ultimate' measurements (she intends to slim down more for the wedding) and she bought it. Who would have thought? One weekend much earlier than she had any intention of buying her dress and it's all done and sorted for more than $1000 less than she intended to spend! 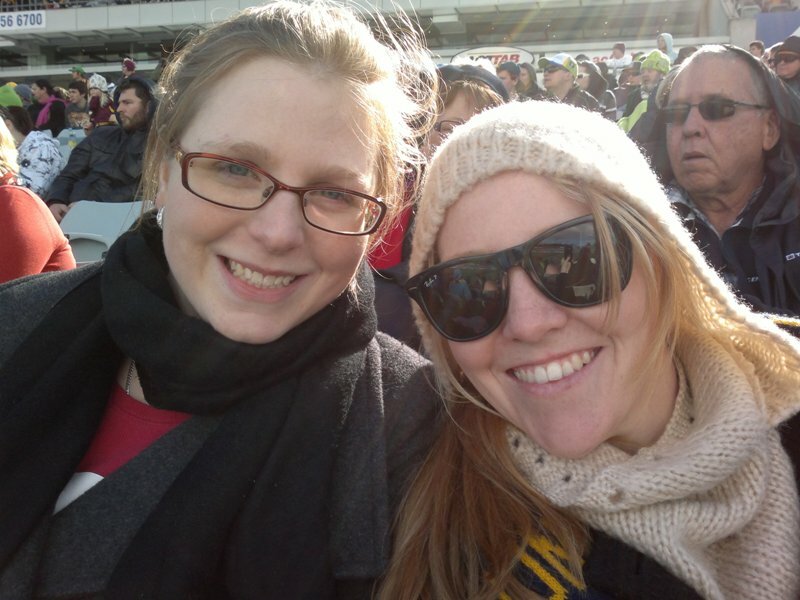 Here we all (well minus MissA's fiance, he was on the other side of her) are at the aforementioned football game. 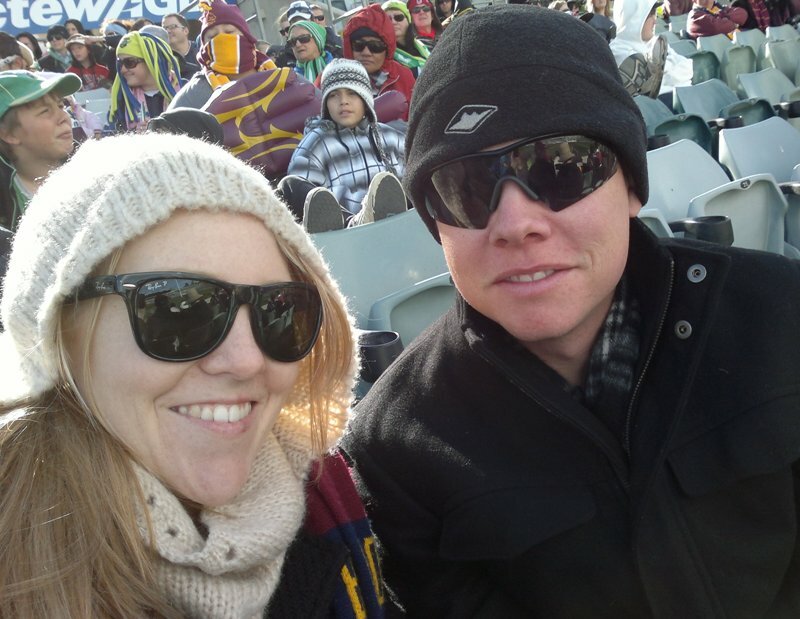 Sat in the cold to watch the Broncos be beaten by the Raiders. And a pretty sunset that doesn't fit into my story anywhere. 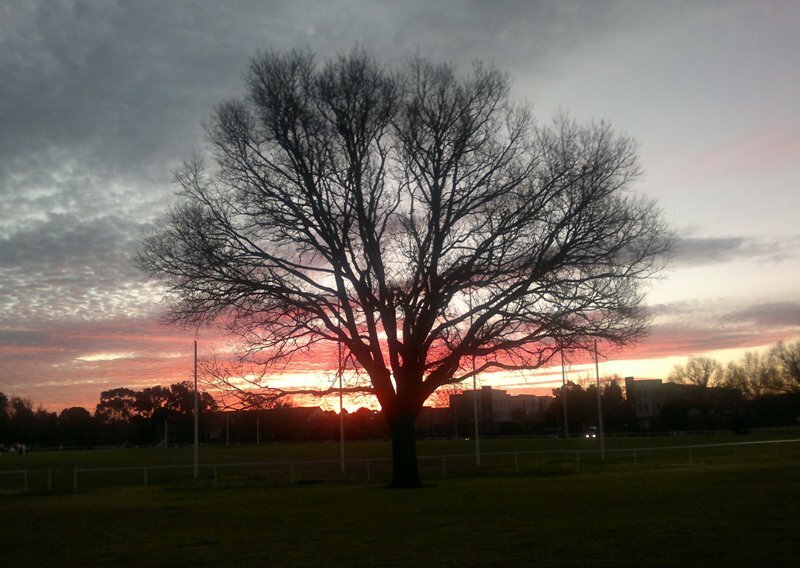 This was the Tuesday evening just before my PT session. As much as I enjoy a good sunset, I can't wait for the sun to be going down later so I am exercising in daylight again! 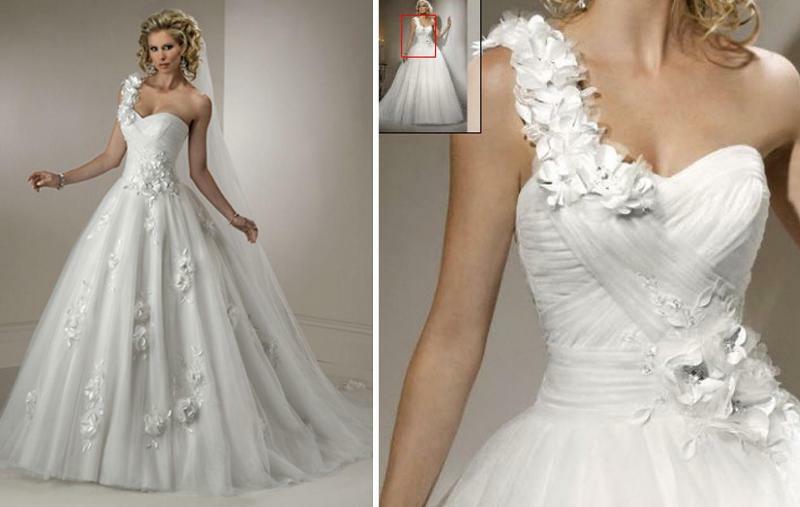 Oh wowww, the dress is beautiful! And what luck about the price! Seems like everything is falling into place :) Gorgeous! Sunset is gorgeous! Even if it doesn't have a place in the story. my gosh I have done the drive from canberra to melbourne, it's awful isn't it! We broke up drive up by staying in Albury overnight and on the way back drove straight home on the sunday. Lucky i have no need to go to canberra very much! That dress is SO pretty. What a great saving too! 65% off??? WOW. I'm gonna start praying TODAY that I a great deal like that when my time comes!! Such a nice dress!! She is going to look amazing and it's so good getting it cheaper then expected!! haha damn Broncos tsk tsk! 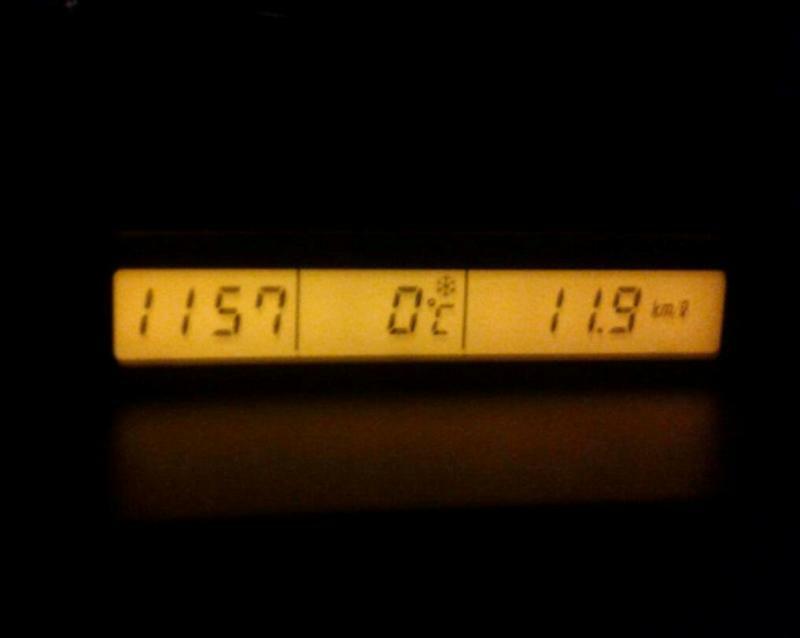 The 0 degrees looks very unappealing!